GRINDER SEWERS – A LOW COST GIFT OR A TROJAN HORSE? Homeowners at the March 27th Orange County Community meeting were told by a director of wastewater management for Orange County that grinder sewers are a low-cost alternative to traditional gravity sewers. It seems every county under septic-to-sewer BMAP mandates is hearing the same thing. Even the Wekiva Basin Commission members were told a few years ago by the Audubon lobbyist/member on the Commission that low pressure grinders were a good choice to get rid of septic systems. The gift of grinder sewers gets even better. The grinder systems may be FREE to the homeowner! FDEP, Water Management Districts, municipal utilities, and county commissions are putting your taxpayer money to work paying for them. Better yet….the Basin Management Action Plans give full credit for septic to sewer nitrogen reduction whether they install gravity sewers or grinder sewers, and the county gets a pat on the back from FDEP for making their BMAP numbers mandate. It’s all good and the Springs are restored. Hallelujah! So, is it their gift to you? 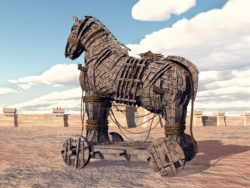 Or, is it a Trojan Horse – the awesome gift that looks good on the outside but is full of nasty surprises on the inside – surprises that pose a threat to your health, your family, and your property and your property values? A tank capable of holding a one-day water and sewage use capacity for the typical home. A submersible pump with a life expectancy of 3-5 years, maximum 10 years. Several floats to trigger the pump out action. Numerous capacitors and relays to manage the starting and stopping of a 2-horsepower motor. Lithium batteries for backup power. If you want to know what the “gift” will cost you, watch this video of a service technician fixing a homeowner’s 2-year old grinder. Homeowner’s repair cost is $1,000. Note the following: 1) electrical errors were made with the original installation and passed by an inspector, (2) build up of grease and residue inside the pump, (3) corrosion is evident after only 2 years of use. If you want to see just how complex a grinder is, watch this YouTube video. Complex designs simply mean there are numerous opportunities for failure and obsolesence. Homeowners insurance does not cover sewer back-ups whether the cause of the back-up is your grinder or your neighbor’s. A special insurance rider must be purchased to protect your home and its contents. You must stop using water and/or vacate your home if the power is out or the grinder fails and cannot immediately be repaired. Cost of hotels is the homeowner’s. Grinder contents must be flushed before leaving on vacation or contents will solidify and require a service call. Gravity fed, traditional sewers have a lifespan of about 100 years, and no homeowner maintenance costs, they are just a simple plastic pipe. If you add the homeowner cost of repetitive repairs to the installation cost of grinders, the total cost is comparable to the cost of gravity sewers. Conventional passive septic systems last about 40 years if properly maintained with periodic pump outs and following simple precautions like using septic safe toilet paper, limiting the use of antibacterial cleaning products, and limiting the use of a garbage disposal. Grinder mechanisms last 3-5 years, up to 10 years maximum, and repairs can be costly and frequent. Cost of ownership is variable. If it’s anything like the cost of owning a car, it can be as much as 50% of the original cost. After the debacle of Irma, no one should say grinders are better for the environment. 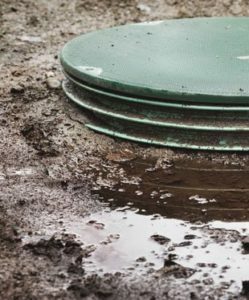 Nitrogen loaded, raw sewage washed into streams and seeping into the ground from failed grinders is a far worse threat than the little bit of nitrogen coming from our septic systems. How BMAP can consider grinders equal to gravity sewers is beyond my understanding. I’m looking the gift horse in the mouth, and it’s not pretty. Note: On April 6, 2018, The Sludge Report was contacted by a contractor who pointed out that because of the Check Valve in a grinder, sewage could not back up into the homes connected to the piping. While we understand that a properly functioning one way valve should stop the flow of effluent into a home, we do not believe it is that simple. If your pump kicks on and receives any blockage in route to a main sewage line, the grinder tank can overflow into your yard. This is a common problem – Just read about Irma and Everglade City. Also, a check valve is just one more failure point. It has a valve seat, a metal spring and a ball valve. Any debris or corrosion can render this safety device useless. So it will depend upon the quality of the valve and proper maintenance to assure that your home remains safe. There is no red light that blinks telling you your check valve is not working correctly. 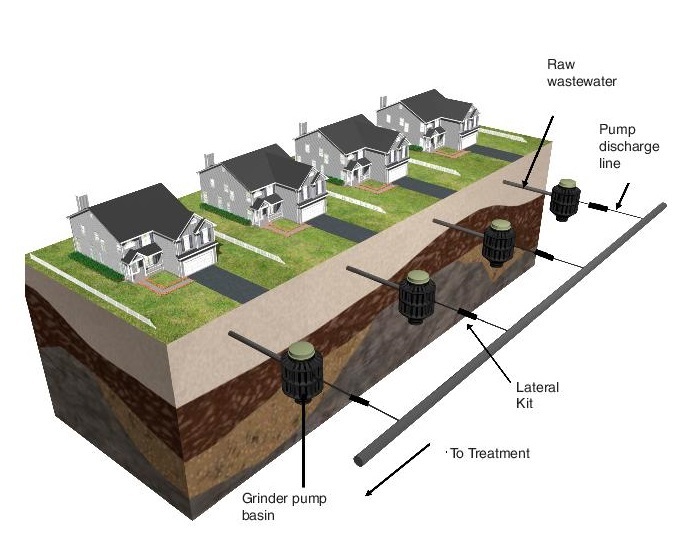 The point being made in all of this report is that a grinder sewer is complex, electrical, mechanical, prone to corrosion and should never be used as a primary waste disposal method for a home.